Bennett was born in Leicester the younger son of John Bennett, a local merchant who developed a successful family business with his elder son, William Swain Bennett (1858-1927), John Bennett & Son, “Corn Merchant, Seed & Flour Merchant and Corn Crusher”, with premises at 76½ Northampton Street, Leicester. However, Frederick Bennett’s interests were scientific and medical rather than commercial, so he went to Owen’s College, Manchester (now Manchester University) to train as a doctor. He gained his MRCS in 1883, graduating with a London University M.B. in 1884 and progressing to M.D. in 1885. Twenty years later, following many years work as an increasingly well-respected amateur geologist he gained a BSc in Geology. His first medical appointments were as a resident medical officer in several Manchester hospitals before establishing his own medical practice back in Leicester. He was soon appointed to the staff of the Leicester Royal Infirmary as an Honorary Assistant Physician and soon developed a life-long special interest in diseases of the ear, nose and throat. At the time this was an under-developed specialism in the UK, and though a number of UK hospitals were beginning to establish specialised departments of laryngology there was still no formal teaching in specialism so Bennett spent some time in Vienna studying advanced Continental practice. On his return to Leicester appointed the Hospital’s first Consulting Aural Surgeon, though with very little support or encouragement, and for a time Bennett even engaged a full-time nurse from outside the Hospital at his own expense to provide him the necessary nursing support to his students and himself. However, by the time of his retirement from the Infirmary more than three decades later he left a well-equipped, greatly enlarged, Department that was fully recognised as an important part of the Hospital and which was highly regarded nationally. Bennett was a man with very wide interests including music and several areas of science, but especially geology. The Lit. and Phil., which he joined in 1894, was very much the centre of his scientific interests, and in addition to his year as President of the Society, he was Chairman of the Geology Section for 23 years right up to his death. He was also active in the wider community, serving for some years on the Leicester School Board, and drawing up its first curriculum for the training of teachers in science, and on the Corporation’s Museum Committee for over 20 years. Along with other leading members of the Lit. and Phil. he was a strong supporter of the campaign for the creation of a University College in Leicester, and at the crucial March 1918 meeting called by the Mayor, Alderman Jonathan North, Bennett immediately offered a contribution of £500 to the successful fund-raising campaign proposed Dr. Astley Clarke at the meeting. Bennett was a member of the College Council from its establishment to his death, and one of his daughters, Rhoda Bennett, was one of the College’s first entry of students in 1921. She was to return to the University College as Assistant Librarian in 1931, and then served as University Librarian from 1932 through to 1961. (Famously, the young Philip Larkin worked with he as Assistant Librarian from 1946 to he appointment as the Hull University Librarian in 1955 .) 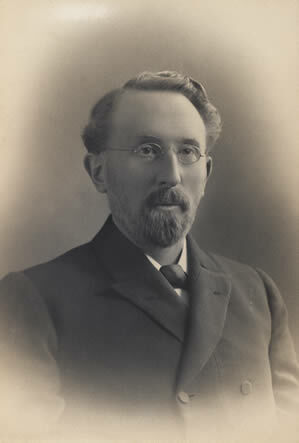 His brother, Henry Swain Bennett (1857 – 1927), bequeathed £500 to the Society for the support of research – the H.S. Bennett Research Fund. On the death of their father Rhoda Bennett and her sister Hilda donated the family home, 104 Regent’s Road, a large and imposing double-fronted Victorian house on the corner of Regent Road and De Montfort Street, to the University College in memory of their father. The two sisters also made a gift of £6,000 to the College to endow a Lecturership in Geology, a gift now commemorated the F.W. Bennett Chair of Geology at the University of Leicester. Also, the University’s 1963-65 building by Sir Leslie Martin and Colin St. John Wilson for the Geology and Geography Departments is named the Bennett Building in his memory. Quite exceptionally, following his death the Lit. and Phil. published no less than three obituaries and appreciations of F.W. Bennett in the 1931 volume of its Transactions: Obituaries and appreciations by E E Lowe (Dr. F.W. Bennett, BSc; A personal note), Bernard Strachey (Dr. Bennett’s geological work on Charnwood Forest) and H H Gregory (Dr. Bennett and the Geological Section) Transactions LLPS Vol. 32, pp. 25 – 34. DR. F. W. BENNETT, B.Sc. ; A PERSONAL NOTE: By E.E. LOWE, B.Sc., Ph.D. When Dr. F. W. Bennett passed away on December 3rd, 1930, the Leicester Literary and Philosophical Society lost one of its most helpful members. He was deeply interested in many phases of knowledge and culture, and was sincere and enthusi­astic in everything he took up. His clear-sightedness and sound judgment, joined to the charm of his genial personality assisted the progress of every movement with which he was associated, within and without the Society. My first meeting with Dr. Bennett was at Plymouth in April 1907, when I was curator of the Museum there. He was visiting the neighbourhood with the Geologists’ Association and, as I was at the moment a candidate for the Leicester curatorship, vacant by the resignation of Mr. Montagu Browne, he was asked by the Committee of that day to interview me and report upon my work and personal qualifications. My ultimate appointment to the vacant post was undoubtedly due to this, for me, fortunate visit. I took up office in Leicester at short notice, in order to help in preparing the Museum to play its part in connection with the British Association’s visit to the town in August 1907. The Literary and Philosophical Society had a responsible share in the local organization for the visit, and Dr. Bennett was very active on behalf of the British Association’s Geological Section. He arranged the local field work, and did much to make this part of the programme the success it undoubtedly was. It is difficult to realize that another visit by the British Association is already in view, and has, in fact, been fixed for 1933. For 36 years Dr. Bennett had been a member of the Leicester Literary and Philosophical Society, and was its president in 1905. He had great faith in the Society as the originator and guardian of local cultural movements, and as the supporter of local research. It was on his advice that his brother, the late Mr. Henry S Bennett, bequeathed £500 to the Society, the interest on which is to be applied to assist original investigations. He was ever an ardent advocate for close co-operation between the Literary and Philosophical Society and the Museum, and took early oppor­tunity to impress upon me the advisability of fostering a spirit of mutual helpfulness and goodwill. At Dr. Bennett’s invitation, I joined the Geologists’ Asso­ciation expedition to the Aran Mountains in Wales in August 1908, and together we collected a good series of the rocks examined by the party. This was the first of many excursions made jointly to various parts of England, Wales, Scotland and Switzer­land, to study geological phenomena and to gather specimens with which to enrich the Museum collections. These excursions are among my happiest recollections. The most memorable expeditions from the point of view of interest and of the yield of material were those to the Lizard in 1913 (and again in 1923), to North Cornwall in 1914, to the Glasgow district in 1915, to the Lake District in 1919, and to Airolo, Switzerland in 1924. As a result of this work, the credit for which is due solely to Dr. Bennett, our Museum is now far richer than most in examples of the various rocks constituting the earth’s crust and in other material needed by the student of our planet’s history. Geology was with Dr. Bennett an absorbing hobby, and he not only attained a high reputation as the local authority on our ancient and complex Charnwood Forest, but he inspired others with an enthusiasm for geological work. The valuable and unique collection of the rocks of Charnwood Forest, collected and given by him to the Museum, is an outstanding feature of our geological collections; and the model of the Forest which he constructed, comparatively recently, with great skill and accuracy, will be of lasting help to all students of the area. He had great gifts as a teacher, too, and his public lectures on geology and other subjects to the Literary and Philosophical Society, and at the Museum Saturday-evening popular lectures, always drew crowded audiences, attracted by the lucidity of his style and by the romantic interest with which he endowed every­thing he touched upon. As a member of the Museum Committee for 23 years, Dr. Bennett played a prominent part in the general advancement of the institution. His sound judgment and the attractive and witty manner in which he helped in the solution of difficulties, great and small, earned him the respect and esteem of every member. He was always appealed to in the appraisement of suggestions for the better equipment of the Museum with scientific apparatus, and he strongly advocated the acquisition of such invaluable instruments as the petrological microscopes, the projector-microscope, and the long-range epidiascope, which the Museum now possesses, to its own and the public’s advantage. It is difficult to convey to those not intimately acquainted with Dr. Bennett any conception of his extra­ordinarily attractive personality. In the gentle art of raillery he was a past-master and no respecter of persons; but so devoid of malice was he, and so light was his touch, that those who figured in the role of target were ever the most amused. This particular trait added gaiety to even the most seriously scientific gatherings. He could be critical when necessary, both of persons and affairs, but to those who had gained his confidence he was an unwavering source of stimulating encouragement. He was ready at all times, no matter how pressing his own problems, to give his sympathetic attention to the difficulties of friends, and when, in recent years, grievous personal sorrow came upon him, he sought alleviation in increased devotion to the service of others. From the moment of my arrival in Leicester to the day of his death, Dr. Bennett showed me unremitting kindness and gave me unfailing help and encouragement. His bright and inspiring presence is yet so vividly before me as to make the reality of his passing hard to comprehend. Sources: Frederick W. Bennett M.D. [by A L Macleod & Astley V Clarke] British Medical Journal, Jan. 3, 1931, pp. 37 – 38; [Obituary and Appreciations of F.W. Bennett] E E Lowe, Bernard Strachey and H H Gregory Transactions LLPS Vol. 32, pp. 25 – 34; Patrick J. Boylan: Henry Swain Bennett (1858 – 1927): a major benefactor of the Leicester Literary and Philosophical Society. Transactions of LLPS, vol. 96, pp. 26 – 27.